In my post about how I pick a crochet pattern, I mentioned that I prefer diagram patterns over written patterns. This style of pattern is also commonly known as a chart pattern. 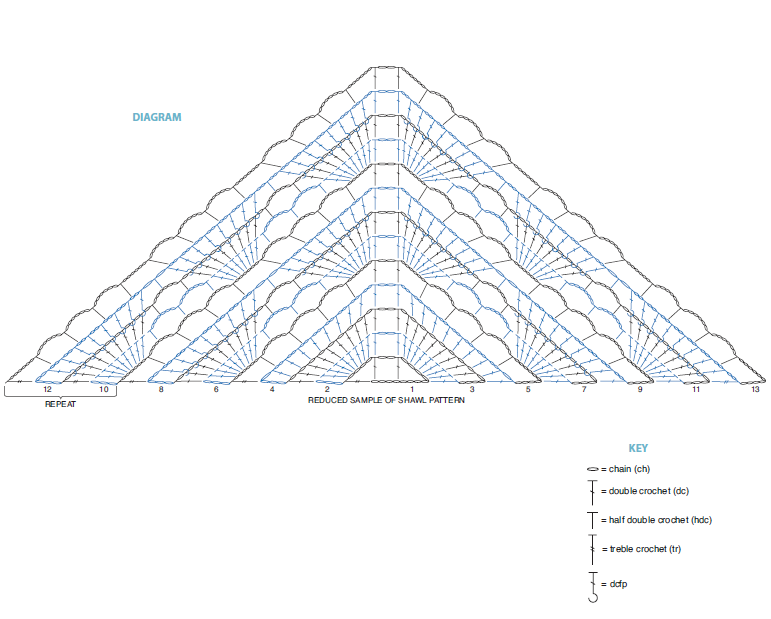 For some people, trying to “read” this type of pattern seems difficult, confusing and (at first glance) it’s overwhelming. So in this post, I want to go over the anatomy of a diagram pattern such as the Yes, Yes Shawl pattern featured on Bernat (and pictured below). Every diagram pattern will have a key listing all the stitches used in the pattern and their corresponding symbol. These symbols are pretty universal and standardized from one diagram pattern to the next. 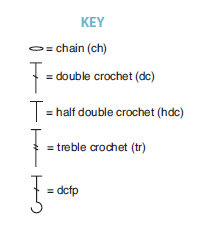 The Craft Yarn Council offers a very good list of crochet chart symbols. You can also read through the key to ask yourself if you’re familiar with the stitches. Typically you can tell where a pattern begins because it’ll have the symbol for a slip stitch followed by a series of symbols for chains. Even though this specific pattern doesn’t show the starting slip stitch, we can tell where we need to start because of the number 1 telling us that it is the first row. So for row 1, the diagram is telling us to chain (ch) 12, we are then going to do a double crochet (dc) in the ninth chain from the hook, then ch 2, dc into the first ch of the foundation ch, chain 4, and treble crochet in 1st foundation chain. To start row 2, we’ll chain 3. You probably noticed that odd rows are black and even rows are blue. The change in color tells us that the work needs to be turned in order to proceed with the next row. You’ll know where a row begins because the number of the row will be in front of the row. Another clue will be the string of chains that typically start a row. Depending on the row you are on, you’ll read the chart pattern from left to right and then right to left as you progress. Also, if any row on the pattern is to repeat, it will be indicated so. So really there is no mystery to a chart pattern – and that (among other things) is part of its charm. Have you had any experiences with chart patterns? Let me know in the comments section below.